This research paper studies knowledge spillovers from Chinese-invented renewable energy technologies and which different technological fields benefit from the knowledge of solar, waste, wind, hydropower, marine, biomass and geothermal technologies. The dataset is based on patent citations of patents filed at the Chinese patent office in the period 2000-2017. The analysis differentiates between total knowledge flows, within the same technological field (intra-knowledge spillovers), to other technological fields within electricity production (inter-knowledge spillovers) and to external technological fields (external knowledge spillovers). 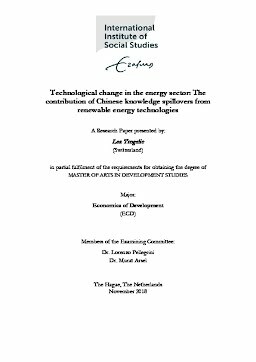 Putting knowledge spillovers into the context of technological change and diffusion, suggests that Chinese-invented waste, solar and wind technologies contributed the most to techno-logical change and diffused the most so far because they are the most frequently cited tech-nologies. While wind technologies mainly profit from knowledge within their own techno-logical field, solar and storage technologies are more likely applied in external technological fields. The latter suggests the promotion of more diversity and modularity within the econ-omy which can increase technological opportunities to recombine knowledge. Marine and geothermal technologies should receive more policy support in China to accelerate their dif-fusion.